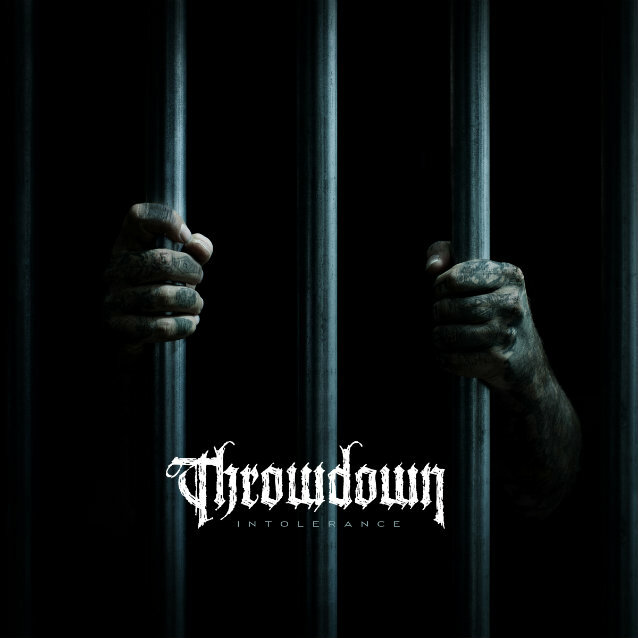 "Intolerance", the new album from the Southern California metal act THROWDOWN, can be streamed in its entirety using the SoundCloud widget below. Due on January 21 via eOne Music, the follow-up to 2009's "Deathless" was recorded at Hurley Recordings in Costa Mesa, California with rising producer Davey Warsop and mixed at Planet Z. "Intolerance" features guitar solo contributions from Dave Nassie (BLEEDING THROUGH, NO USE FOR A NAME, INFECTIOUS GROOVES), who joined THROWDOWN's recent touring lineup alongside DEMON HUNTER drummer Tim "Yogi" Watts and "Deathless"-era bassist Mark Mitchell. Comments THROWDOWN frontman Dave Peters: "Completing this record felt great in so many respects, most important of which was the opportunity to finally give longtime supporters of the band this music that I've had swirling around in my head over the past four years. "The variety of people from different places and scenes who have found the band through vastly different avenues over the past 15 or so years will each get into it for their own unique reasons, I think. And for those who think it’s junk, it's only about 28 minutes they have to regret." "Intolerance" combines the massive production punch of the moody, sludgy and powerfully diverse masterpiece "Deathless" (which spawned the Sirius XM staples "This Continuum" and "The Scythe") with the focused resolve of the band's genre-classic-filled back catalog. The big sound that developed on "Deathless" works magic upon the brutal missives found all over "Intolerance", nearly all of which clock in around two minutes. "Deathless" and "Vendetta" collaborator Chris "Zeuss" Harris (HATEBREED, CROWBAR, DEMON HUNTER) returned to mix the new record. Drummer Jarrod Alexander (AMERICAN NIGHTMARE, SUICIDE FILE, MY CHEMICAL ROMANCE) made his first recorded appearance with THROWDOWN on "Haymaker", returning as a session player again for "Deathless" and the brand new album, "Intolerance".